Hello March! So we are done with all the festive seasons and holidays; back to reality, shall we? Yikes… the current scorching hot weather, workload, back to back deadlines, traffic jam and stress. Be warned my temperature is rising inside and outside, before I explode I decided to chill and cheer up myself. So online shopping mode is on! I am hunting for gadgets and end up buying from GEMFIVE. Well, it has been a while I wanted to buy a compact camera but I was not sure which brand and model to go for. At last I decided on this one because dslr is pretty heavy and bulky for me. I ordered from GEMFIVE and within 2 working days I received my camera. I unbox and checked everything is in good condition and from the authorized dealer in Malaysia plus comes with warranty. Tested the camera and working well. Yes I like it. GEMFIVE is an online shopping destination that we can find more deals, discounts and savings from electronics, gadgets, fashion, beauty, health, home & living, mum & kids and also lifestyle. It was founded in 2015 and now they have over 1500 brands. What I like about GEMFIVE is that their site is easy to navigate and user friendly. I can easily find the things I like plus look out for the latest must-haves or deals. After all, what we want is to buy the products that we are looking for at a good price, checkout, pay and receive our order in good condition. 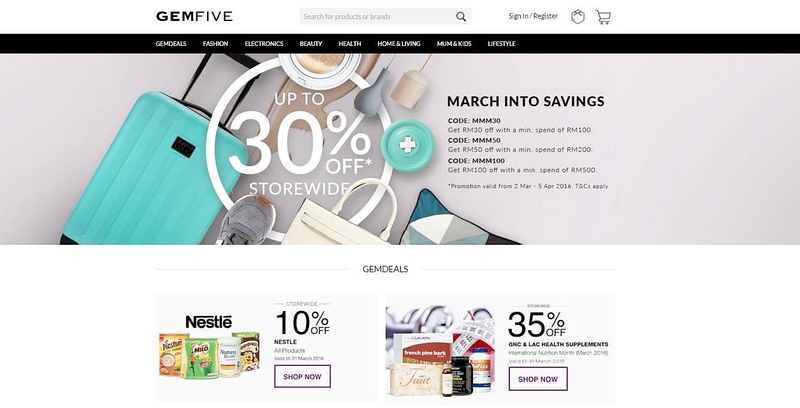 It was a pleasant shopping experience at GEMFIVE, they make things simple with curated good finds, tips and tools, and daily inspirations for everyday living. For example this month they are having The Great Tech Sale up to RM450 off and also March into Savings whereby you can get up to 30% off storewide plus extra RM100 off your purchase when you spend RM500 and above. Special for my readers and followers! I will have to check out this site soon. GemFive! I like to shop there too. Nice camera you got there! heard about GemFive but never used it before. thanks for reminding me the great service they have! will try soon. Nice! Can't wait to see you around with your new camera! Will seek more your advises on June. Nice Camera . I'm searching a camera with a skin that can be flip! The camera you bought so nice! Never try black camera before but this camera looking good in terms of size and spec. Should go Gemfive to look for more goodies hehe! Good Cam - looks, features and overall. Canon is always a trusted brand.